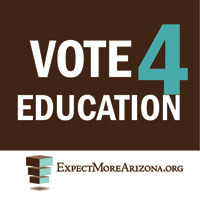 Arizona Voters Approve Sales Tax for Education! A referendum to increase the sales tax by 1 cent, with 2/3 of the revenue designated for education passed in Arizona yesterday, with a stunning 64% of the popular vote. If conservative Arizona can do this, why can’t we even get Penny for Kids introduced in Wisconsin? Sign the Penny for Kids petition and drop your legislator a line asking them that question. New York Times report; Reuters report; Expect More Arizona (vote yes campaign).